The Sustany® Sustainable Business Program was developed by the Sustany® Foundation in 2012 to help local businesses realize the value of adopting sustainable business practices. On January 28th, 2015, students from the USF Patel College of Global Sustainability and USF School of Geosciences started the first leg of a 12-week internship to assess sustainability practices at the Straz Center as part of the Sustany® Sustainable Business Program (SSBP). The SSBP, established by the Sustany® Foundation in 2012, was developed to help local businesses realize the value of adopting sustainable business practices while concurrently allowing college students to gain real world experience as sustainable consultants. In 2014, the SSBP matched student sustainability specialists with a single organization, leading 10 businesses in the Tampa Downtown Partnership district to be designated as City of Tampa Green Businesses. This year, the format has altered slightly to allow nine students to work together in teams in order to assist a single, large organization. 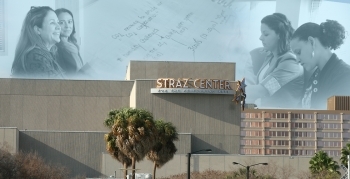 The Straz Center, the second largest performing arts complex in the southeastern region, was selected in order to further sustainably-focused research specific to high-traffic venues such as energy efficiency, waste management, environmental impact, and understanding the supporting data. Janet Hall, founder of Hall Sustainability Consulting LLC and member of the Sustany® Foundation Board of Directors, led the internship orientation. The orientation, which included a total of 9 student sustainability specialists, began with an external tour of the Straz Center followed by an initial meeting with Tom Wright, Facilities Director of the Straz to discuss improving recycling practices. The students will work in teams to evaluate the Straz Center within three main categories: data, waste, and energy/lighting. They will track historical and current performance and calculate future savings for proposed initiatives with a focus on operational cost and impact on Straz and the surrounding community. Participating Patel students include: Trista Brophy, Yara Watson, Ericka Leigh McThenia, Adit Patel, Barbra Anderson, Steffanie Agerkop, Carmen Garcia, and Bianca Cassouto. Greg Whitener also participates in the program and is currently studying at the USF School of Geosciences.